Misticks Reed Diffusers are a fresh, new way of adding fragrance to a room. 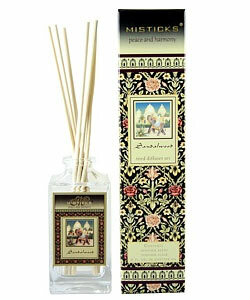 These petite Reed Diffuser Sets from Misticks are an ideal size for fragrancing a more personal space. Ideal in an office cubical, a student dorm, at bed side or in the powder room. Set contains 2 oz. diffuser oil in seperate screw cap bottle, glass decanter bottle as shown with six diffuser reeds 7 1/2" tall in decorative package. Pour the enclosed 2 ounces of reed diffuser oil into the included diffuser flask. Insert and arrange the provided reeds. After about an hour you will begin to notice the fragrance wicking up the reeds and diffusing into your home. Occasionaly, flip the reeds to invigorate the fragrance. Enjoy!